Heart Rate Monitors / Watches. OMM Aether Unisex Black Waterproof Long Sleeve Running Hooded Jacket Top. OMM Aether Smock Running Jacket. The Aether smock comes loaded with new and innovative features to help keep the warmth in with closures around the wrist, waist and face - perfect for those winter hikes and mountain biking. The new features are combined with eVent's new DVSTORM 3 layer fabric which achieves the target weight of 195 grams whilst maintaining optimum performance - especially in high intensity events. Further changes from the Aether come in the form of moving from YKK Aquaguard zips to a POINTZERO pocket lining which reduces standard mesh by 30%. From a safety perspective the smock offers reflective logos and print to help those running on the road or paths at night time. The hood is fully adjustable and the coat also has an internal bonded stormflap as well as a face gussett to help against adverse weather conditions. Two large pockets with bonded pocket bags are perfect for storing small items such as mobile phones, keys and wallets so a bag is not required. Which is idealistic for running. Active cut with minimalseam construction - Allows free movement without losing comfort and stability. Fully adjustable wired and laminated mountain hood - Protects against harsh weather and differing altitudes. YKK Aquaguard Zip and internal bonded storm flap - Provides substantial protection against elements, is waterproof and hassle free to use. Active multi cuff - Fastens around hand creating a thumb loop. Protects wrist against water whilst keeping you warm. Dynamic Droptail - Keeps waistline in place and allows water to run off more efficiently. Face Gussett - Protects against wind and other harsh elements. Reflective logos and print - Improves safety when active at night-time or split up from groups. 2 larger pockets with bonded pocket bags and YKK Aquaguard zips - Great for storage of smaller items and does not interfere with performance. OMM Aether Smock Running Jacket - SS17 Product Features. 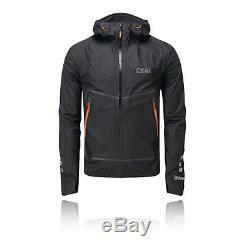 Features: Waterproof, Water resistant, Breathable, Pockets, Reflective, Full Zip, Zip pocket, Hooded, Windproof, Warm. All orders placed before 1pm Monday to Friday will be despatched that same day. For example, if you place your order after 1pm on a Friday or over the weekend, we'll despatch it the following Monday. Orders Delayed / Missing in Transit. We promise we'll do everything we can to ensure you receive your order within the time-frame specified. We work with our couriers who have a 97% accuracy for their 3-5 day service. Occasionally events beyond our control may result in your parcel being delayed whilst it is with the courier and we cannot be held responsible for such delays. All parcels are fully insured and if your parcel is lost or delayed, let us know and we'll act quickly to locate it, bearing in mind the points below. All claims for missing items must be made within 28 days of the date of your order. We'll then contact our courier to investigate and locate your parcel. Items are classed as missing in transit by our courier if they haven't been delivered within 7 days from the date of despatch. At this point we'll ensure replacements are sent to you immediately. Please note that we'll ask you to complete a Lossage Form prior to sending replacements. When you receive your item you have upto 30 days to change your mind and send it back to us. Your statutory rights are not affected. Letting us know what action you would like us to take, e.
This will help us to ensure we process your return quickly and effectively. Please enclose your invoice, letting us know what action you would like us to take, eg. This will help us to ensure we process your return quickly and efficiently. In all other cases, we will not be respponsible for the costs incurred for returning ordered items. At sportshoes, we're passionate about sport. At Sportsshoes we want you to shop with confidence and that's why you'll find shopping with us is easy, hassle free and reliable. Brand new ranges and clearance deals. With over 5,000 products to choose from, we stock the most comprehensive range of technical sports footwear and clothing in the UK, covering the widest range of sports and all the major brands. As well as stocking the latest premium products with the latest technologies, we also work hard to bring you the best possible clearance deals. Bruce Bannister - the man who started it all. As a striker, Bruce appeared in over 500 league games, and scored over 200 goals. He was part of the famous "Smash and Grab" partnership with Alan Warboys at Bristol Rovers in the early 1970s before finishing his professional career in France in 1981. As an executive member of the Professional Footballers Association for 10 years, Bruce looked after the interests of players and fans, and it was during this time he recognised a need for a retail store dedicated to the specialised needs of sports men and women. Sportsshoes Unlimited - a passion for sport. Armed with his passion for sport and the knowledge and experience to understand the needs of athletes of all standards and levels, Bruce set up Sportsshoes Unlimited, the largest sportsshoe retail outlet in the world. His aim was to provide the most comprehensive range of technical sports footwear and clothing, covering the widest possible range of sports and every major sporting brand. Today we are SportsShoes and fulfil thousands of orders each week, as well as continuing to provide an excellent level of service. With over 25 years of experience behind us, our objective remains the same, and we're committed to providing the same superb service, combined with the widest and most comprehensive product range at the best possible value. The item "OMM Aether Unisex Black Waterproof Long Sleeve Running Hooded Jacket Top" is in sale since Friday, November 18, 2016. This item is in the category "Clothes, Shoes & Accessories\Men's Clothing\Coats & Jackets". The seller is "sportsshoes_outlet" and is located in United Kingdom. This item can be shipped to all countries in Europe, all countries in continental Asia, United States, Canada, Australia.